Solid State Hybrid Drive (SSHD) has been recognized, since its first release in 2010, as the most viable alternative to the traditional mechanical hard drive (HDD), by featuring an ideal compromise between speed, capacity and price, making itself the first choice of every PS4 user who looks forward to upgrade the stock hard drive so as to gain more storage space and better performance for their game console. Undoubtedly, the PS4 stock hard drive is an obsolete, slow, and useless drive for serious gaming, and upgrading it to a better drive is inevitable for every user who cares about enhancing their gaming experience. With an SSHD, you can benefit from the high speed of SSD alongside the capacious storage space of HDD. All of that for an affordable price, that is little more expensive than a mere traditional HDD (From $5 to $10 price difference). Moreover, the good news is that all PS4 models can employ an SSHD as a main storage device in place of the stock drive. So, whether you own the base PS4, PS4 Slim or PS4 Pro, the upgrade process is exactly the same. It’s a fact that there are not many SSHD brands in the market, and even the SSHD models of the same brand are rare. So, don’t wonder if you don’t find many hybrid drives to recommend here, as their availability is limited. Additionally, we will only recommend 2.5-inch SSHDs that directly fit into PS4 drive cage. We don’t include in our list any 3.5-inch drive, that’s basically designed for desktop computers. Moreover, although the PS4-compatible SSHDs come in three available storage capacities, ranging from 500gb to 2tb, we will only recommend 1tb and 2tb, as we believe that 500gb of storage capacity is too limited to meet the modern storage requirements of an average PS4 user, let alone enthusiasts. Note that with a 2tb SSHD you will get around 1.77gb of usable storage space. The 2tb storage capacity is the most recommended for every serious PS4 users, due to the fact that top-notch games are coming now in huge file size that can easily exceed 80gb for a single game. That’s regardless the UHD movies you want to store on the internal storage device which will definitely cut down on the usable storage space. Below, only Seagate SSHDs are listed, because Seagate is the only SSHD brand available in 2tb. Alternatively, you can go for a complete PS4 SSHD upgrade kit that includes everything you need to fulfill the upgrade process the right way. That’s all for the 2tb PS4 SSHD section. There’s no more item to add, because Seagate Firecuda 2tb SSHD is the only 2tb SSHD in 2.5-inch form factor in the market. The 1tb SSHD storage capacity comes next in popularity after the 2tb. It’s a good choice for users who believe they don’t need more than 1tb of storage space for their gaming purposes, and simultaneously want to improve the performance of their game console. Note that with a 1tb SSHD you will get around 861gb of usable storage space. You can go for older models if you wish, but we don’t recommend that, as you’ll only save a few dollars and lose the new technical implementations in the newest model. The good news here is that there’s another 1tb SSHD alternative offered by Western Digital, in case you don’t like Seagate brand. That’s it. You’ll not find any other 2.5-inch SSHD in the market that fits for PS4 internal storage upgrade. If you get to know the benefits of upgrading PS4 hard drive to an SSHD, you’ll realize why it has been picked by many experts as the best internal storage upgrade for PS4. Below, we will address the main advantages and disadvantages of replacing PS4 internal hard drive with an SSHD. Remarkably improving system performance. Your PS4 will boot up faster, and games and movies will take less time to fully load. It’s worth to notice here that some old games that haven’t o been updated since more than 6 months, won’t have big performance improvement. That’s because these games have been coded with the PS4 stock hard drive in mind and based on the old releases of PS4 system software. Therefore, if the game did not update to conform to the new standards, it won’t benefit much from an SSHD. But like what’s said, just some (not all) games undergo this problem. Solid Reliability without barely any error. If you get to read the complaints of many PS4 users of the errors/failures the PS4 stock hard drive generated after few months of heavyweight playing, you’ll simply realize that the stock hard drive is a cheap, worthless drive (read about that here). But with a modern drive, especially Seagate Firecuda SSHD, that implements the latest storage technologies, to offer the best possible performance out of a mechanical storage device, the errors/failures will be very rare in your life, especially with the 5-year warranty Seagate is giving on its Firecuda SSHD. Capacious storage space. If you opt for a 2tb SSHD, you’ll get a vast space to install and play many AAA-grade games that come in huge file size. This will greatly benefit gamers who share their PS4 with other people (e.g. family members). Compared to an external storage add-on, upgrading to an SSHD offers the same benefits of replacing PS4 internal HDD with a modern drive (read more here). These are all the major advantages of upgrading PS4 hard drive with an SSHD we could think about. Not all games will significantly benefit from SSHD. Especially the ones that have not been updated to conform to the new standards of modern storage devices and the new features of PS4 system software. An SSHD can only be used as an internal hard drive, and there’s no chance to benefit from its multi-tier caching system as an external storage device. This means you’ll have to replace the stock hard drive of PS4, and go through the backup and restore process, alongside installing the PS4 system software from scratch. All of that can take up to 2 hours and not everyone has the patience for it. In order for an SSHD to unleash the power of its multi-tier caching system to improve the performance of PS4, you need to run a specific application/game at least five times in order for the SSHD to learn that it’s a frequently-used software so as to add it to its memory for a faster load next time. Otherwise, it will perform just like a mere mechanical hard drive. An SSHD is more expensive than a regular hard drive, and that might not please some users. Although an SSHD offers a much better performance than a traditional hard drive, its SSD caching technique cannot take that performance to the level of SSDs. If you contemplate on these disadvantages, you’ll find out that they are indeed minor and don’t have a real value if compared with the advantages. You can read more about the best methods to upgrade PS4 internal hard drive on this article if you want to find more options for this purpose. Upgrading the internal hard drive of PS4 or PS4 Pro to an SSHD is super easy. You just need to make sure you have the right equipment in hand, and carefully follow the few upgrade instructions. You don’t need to be a professional or even a savvy to fulfil the upgrade process the right way. So, rest assured. The spanking new hard drive – a Seagate Firecuda 2TB (2.5-inch). A geeky 1GB Flash Drive for housing the latest PS4 System Software. A trusty Philips head screwdriver. Any portable hard drive (at least 500GB) for backing up and restoring your PS4 content. Now, follow the instructions illustrated in the video below, and you’ll be fine all the time. Before deciding whether a hybrid hard drive (SSHD) is a good PS4 storage solution for you or not, you need to educate yourself first about it and how it works in order to realize why it surpasses the performance of traditional hard drives, and why a serious gamer who is concerned about performance must definitely consider it for their PS4. Solid State Drives (SSD) are magnitudes faster than Hard Disk Drives (HDD), whereas HDDs are way larger in space than SSDs. It would be a brilliant idea if there exists a single drive designed to be a compromise between these two technologies together and offers the best of their features for an affordable price to the masses. This persistent need for such a solution triggered the mind of storage device manufacturers to innovate what they called: Solid State Hybrid Hard Drive (SSHD). In a nutshell, Solid State Hybrid Drive (SSHD) features the combination of Hard Disk Drive (HDD) and Solid State Drive (SSD) into one form factor (i.e. you get a single drive structured with these two storage technologies altogether). The primary concept behind this pattern of design is to leverage the high speed of SSD and the massive capacity of HDD simultaneously while keeping the drive at a relatively low cost. 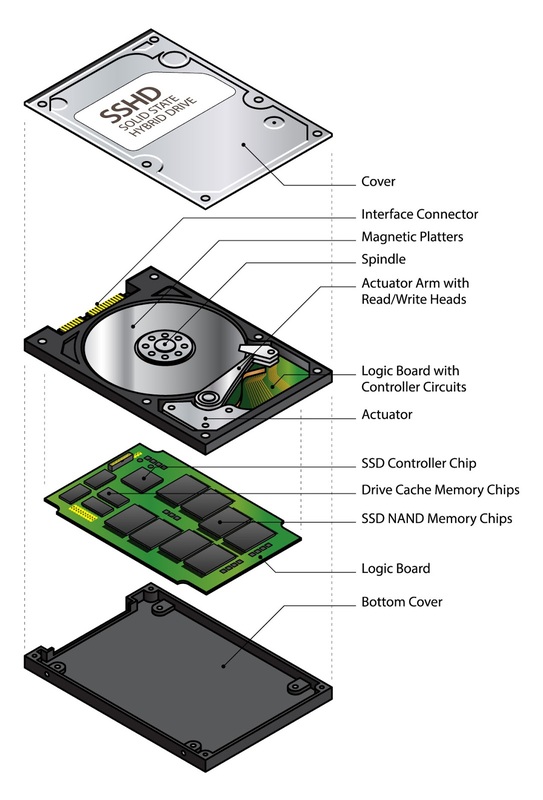 SSHD technology works by using a relatively small amount of high-performance NAND flash solid state memory to store the most frequently used data. This is the SSD portion of the drive, typically around 8GB in size, meaning files can be accessed far quicker than HDD. The rest of the SSHD is made up of traditional HDD storage, usually 1TB and above, to hold the bulk of your lesser used files. This could be anything from games to video music and documents. Since an average computer workload accesses a relatively small portion of the entire data stored, most frequently used data needed by the host computer will be located in the solid state memory when requested. When this is the case, system performance improves because there is less time spent locating, reading and delivering data to the computer. SSHD is designed to “learn” the user’s behavior on the system and accordingly determine the frequently-used files in order to store them later in the SSD portion of the storage device. That means, in other words, the initial launch of a particular application won’t benefit from any performance advantages the incorporated SSD offers until it is launched multiple times to the extent that the SSHD’s built-in management software learns that it’s a frequently-used application then stores it on the SSD portion to make it ready for the next launch with a much higher speed. This concept is similar to that of RAM memory, except that RAM is a temporary cache memory, which is drained off entirely once the system is shut down, whereas the SSD cache on SSHD is permanent until the built-in management software learns that a particular stored application is no more frequently used. Now you can better imagine how PS4 operating system will benefit from SSHD. Read more below to get a clearer view on this matter. If you look at the specifications of modern SSHDs, and how they are designed to manage high transfer rates, you’ll easily get to know that PS4 Pro will benefit from it the most, especially after the wide-range support Sony showed to PS4 Pro in the newest system software update, like the “Boost Mode” feature that can only be used on PS4 Pro. When you bear in mind that PS4 Pro has a more powerful CPU, and its motherboard support SATA III standard, it’s easy then to imagine how an SSHD will perform in that professional platform. Our readers know that we consider solid state drives (SSD) the best storage solution for PS4 Pro, in terms of performance, as we stated it several times, specifically in this article. But the primary drawback with SSD is its price, and an SSHD features a great compromise between SSD and HDD. We have said it many times now, and we keep repeating it: an SSHD or hybrid drive is the best storage solution for PS4, no matter what model you own. You’ll get a modern drive that implements the latest storage technologies and employs an SSD memory to dramatically increase its overall performance and surpass the fastest mechanical hard drive in the market, because SSDs are known to be the fastest storage device ever in history. So, you’ll get all of that in one device and for a reasonable price. To us, we consider it a great deal, unless you have the sufficient budget to get an SSD instead. So are you guys going to try a usb 3.1 NVME m.2 external HD or do I need to do it? ok fine ill do it! Is it possible to put the old Ps4 drive into an enclosure and perform the restore from that rather than from backing up to another drive? Yes it is possible, you first have to put the SSHD into the enclosure and hook it up to your PC to initialize/partition the drive and format it to exFAT. Then backup your old drive on to the SSHD (takes 3-4 hours), once completed save the backup file on your computer (takes about an hour). Then put the SSHD into the PS4 and the old drive into the enclosure. Then plug the old drive now in the enclosure into your pc, format it to exFAT, and save the backup file from the computer to the drive (takes about an hour). You can then use the old drive to restore the newly installed SSHD (takes about 1.5-2 hours) after you have installed the Playstation initialization software from a flash drive. Thanks for your comment. Please carefully read his question. He apparently didn’t want to go through all the process you have illustrated. He only wanted an easy and direct migration process.